My 8th Grade World: My 1st DonorsChoose! 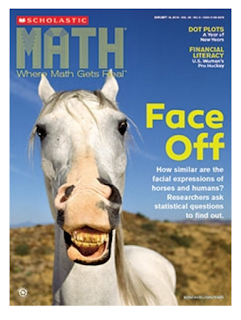 I'm working on getting a set of Scholastic Math Magazines for my students and all Math students in the 8th grade. It is also awesome because we can share these Math Magazines with 6th and 7th graders because the magazines (and online resources) come with several math concepts and topics covered through each edition! It is a wonderful way for middle school students to see how current math lessons relate to their interests and future dreams! Check out the Project Here!! To have your donation matched dollar for dollar, enter the promo code LIFTOFF on the payment screen. This awesome match offer lasts through May 19th. Your gift will help me, my current students, and future students tremendously. I would be very grateful if you would pass on this message to anyone else who could help.